Charmayne Healy (l) and Miranda Kirk (r), co-founders of the Aaniiih Nakoda Anti-Drug Movement, and Melinda Healy, a participant in the peer recovery support program. There’s a narrative about the methamphetamine epidemic in Montana that says the state tackled it in the 2000s, and now it’s back with a vengeance because of super labs and drug cartels in Mexico. But here on the Fort Belknap Indian Reservation, it never really went away. "Getting high in your car in front of the store; that ain't a big deal," says Miranda Kirk. "Leaving your paraphernalia out in the open for someone to walk in; that's alright. Having and seeing needles everywhere; that's ok. Even talking about selling your needles; that's normal too," Kirk says. Kirk is a 27-year-old mother of four. Born and raised in Fort Belknap, home to the Aaniiih and Nakoda — or Gros Ventre and Assiniboine tribes — she grew up around drugs, alcohol, and addiction, and has dealt with the fallout her whole life. "We were dealing with schools now with people that are saying they're seeing it as young as third grade, because, 'oh that's ok, I see that at home'. 'My aunt does this,' 'my mom does this.' 'My dad does this.' 'My grandpa does this.' So, they can't see the error in it. Or they don't see it as a risk." 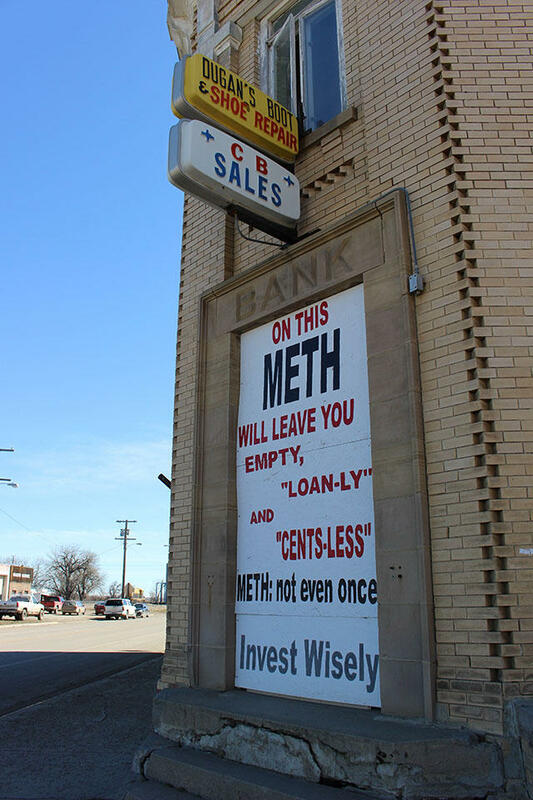 A sign on an old bank building in downtown Harlem, Montana near the Fort Belknap Indian Reservation warns of the costs of using methamphetamine. It’s hard to pin down exactly just how prevalent substance abuse is for specific native populations. But the Indian Health Service estimates that between 2011 and 2015, dependence on methamphetamine and other psychostimulants more than tripled for tribal members in Montana and Wyoming. 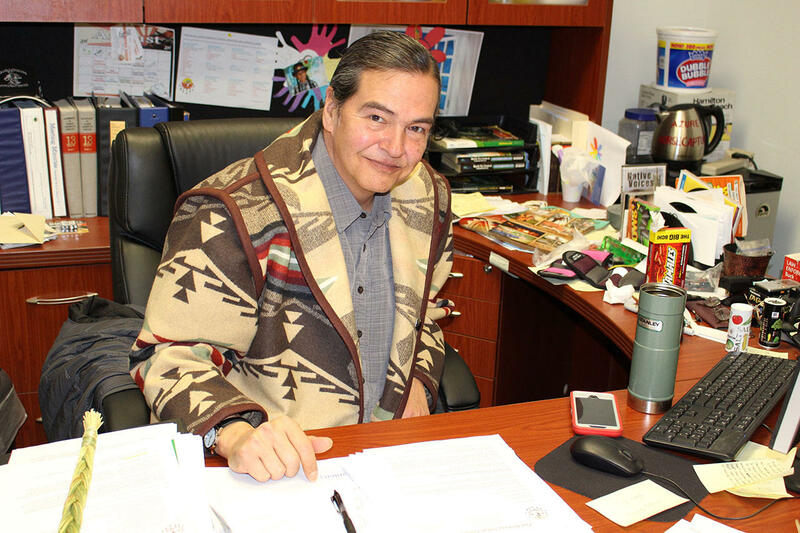 George Horse Capture Jr., the Vice President of the Fort Belknap Tribal Council, says a lot of people get into using and selling drugs here in the first place because the reservation is at the junction of several major trafficking routes, there are gaps in police jurisdiction that traffickers exploit, and unemployment is really high, close to 12 percent on the reservation. "Cuz there ain't nothing around. This Hi-Line is suffering nowadays because it's not the way it used to be years ago. There was tons of jobs,” Horse Capture Jr. says. It’s complicated, definitely. But Miranda Kirk and her sister, Charmayne Healy, felt like everyone had given up trying to do anything about the rampant drug use. And, they worried about their kids falling into the same trap. Fed up, the two of them went to tribal leaders last year and said someone needs to do something. Now. “It was very heart-lifting to see young people are recognizing what's happening to their numbers," Horse Capture Jr. says. "It's their age bracket that has really taken a beating." With Horse Capture Jr.’s help, the sisters persuaded the Council to first declare a state of emergency against methamphetamine last January. This hadn’t been done before. George Horse Capture Jr., Vice President of the Fort Belknap Indian Reservation, was an early supporter of the Aaniiih Nakoda Anti-Drug Movement. Tribal leadership was ready to spend some money to address their state of emergency, what Horse Capture, Jr. calls the smallpox of his day. They allocated $150,00 from a tribally-owned profit-sharing venture and said to Kirk and Healy, how about you go do something? Kirk and Healy were caught off guard, but un-fazed. Right away, Kirk started hunting around for a substance abuse prevention and treatment model that might work with the strengths of Fort Belknap. She started hearing about something called “peer recovery,” a movement centered on the idea that people who have succeeded in recovering from their own addiction are uniquely equipped to coach others. "The lightbulb came on. I’m like, that’s right," Kirk says, "That works, because what got me clean, they weren't peer mentors, but in a sense they were peer mentors. They've been there. That made it easier for me to be able to express myself and not feel judged, or condemned, or like I'm a horrible person for what I was going through." Kirk’s talking about her own struggle with an opiate addiction. She suffered from depression and went through three miscarriages that landed her in the ER and home with a handful of prescriptions. But, with the help of her church family, she was able to kick her habit. Her husband, a former meth addict, is clean now too. "If you have that strong support system, if you feel like somebody is in your corner, and if you have strong faith, that makes any kind of pain, any kind of challenge, any kind of barrier in front of you, seem a few inches tall. Seem like it's just a little tiny molehill instead of a mountain,” says Kirk. She started going around to all the communities on the reservation, asking addicts she knew why they didn’t seek out treatment at the Chemical Dependency Center on the reservation, or elsewhere. They told her that there’s a lot of stigma attached to reaching out for help. In early 2016, Miranda Kirk and her sister officially launched the Aaniiih Nakoda Anti-Drug Movement, one of the first native-led peer recovery pilot projects in Montana. A sign welcomes people to the Fort Belknap Indian Reservation, home to the Aaniiih and Nakoda, or Gros Ventre and Assiniboine, tribes. Thirty-year-old Jessica Healy came knocking at their door before they were even up and running, when her only son was taken away last year. "They helped me. And it took a big step, a big old jump, it took all that I had,” Healy says. Healy’s been using drugs, including meth, on and off since the age of 18. Right now, she’s sitting in the cafeteria of an elementary school in Lodge Pole where she comes every week for the Life Givers Circle, a group for Native American women dealing with addiction and co-dependency. "We talk about stuff and we make ribbon skirts, activities, and we just help each other out,” Healy says. It’s one of about four peer support groups that Miranda and Charmayne have helped start, both on and off the reservation. “It was a good feeling to be clean and to be close to people that had been going through the same thing and to know that there's others out there,” Healy says. Jessica is not an outlier. Peer support has a lot of potential. A growing body of research shows that people who stay in peer recovery programs don’t relapse as often. They’re charged with fewer crimes and have fewer re-hospitalizations, which saves the state money too. And then there are the results that are tougher to put into numbers, like having better relationships, less anxiety, and a higher overall quality of life. Dyani Bingham works for the Billings-based Rocky Mountain Tribal Leadership Council. She helps peer projects like this one build capacity. She says she’s impressed with what’s been going on in Fort Belknap. Aaniiih Nakoda does more than just peer-to-peer and group meetings. They go into schools and talk to kids about prevention, and help organize events like zombie walks, where people pretend to be the drug-addled walking dead. Their goal is to eventually change the narrative where they live. At this point, there’s only one outpatient drug treatment facility on Fort Belknap, and no emergency housing or sober living facilities. The only aftercare available is the peer support Miranda Kirk’s group does. But it’s got some new potential to grow. At the end of March, Montana enacted a new law setting clear standards for peer recovery specialists, which could make it easier for them to bill insurance companies and, potentially Medicaid. Bingham says that’s huge, and goes a long way in legitimizing the profession. While the law is a crucial first step, it doesn’t immediately fix the cash flow issues for grassroots programs that do peer recovery. In the meantime, Miranda Kirk and Charmayne Healy plan to incorporate their anti-drug organization as a nonprofit. One year in, six of the 20 clients they’ve helped have stuck with their recovery goals. That’s triple the number Kirk planned for. She’s optimistic about continuing their successes, but knows from experience it won’t be easy. "You have to keep your phone on during the night because addiction don't sleep and normally we don't either,” Kirk says. In addition to Fort Belknap, there are currently native-led peer recovery programs on the Crow Reservation and in Billings. And the tribes from Fort Peck and Rocky Boy's are interested in starting their own now, too. This story was produced in collaboration with the Meth Effect, a reporting project at the University of Montana School of Journalism. Montana Attorney General Tim Fox announced a new strategy to combat substance abuse in the state on the Capitol steps Wednesday afternoon. Montana lawmakers from both sides of the aisle, along with state agency workers and members of the public convened in Helena Saturday with one big problem to discuss. "Without question, everyone in here, in this room, every citizen in this state, every resident of my community is affected by methamphetamine." Montana’s ballooning meth epidemic is overwhelming state law enforcement, addiction treatment centers, and the criminal justice system. That was the theme of the Montana Meth Summit - a bipartisan gathering of state lawmakers, agency officials, and members of the public held at the capitol on Saturday. As Montana lawmakers look to find ways to trim state spending amid a budget shortfall, officials who oversee the state’s foster care system say they need more money to keep up with their rising workload. Montana’s Department of Health and Human Services expects the number of kids in foster care to continue growing in coming years, to the point where they’re asking lawmakers to add more than $16 million to their $76 million budget. Lawmakers in Helena Wednesday considered a proposal to study how increased reports of meth use in Montana are impacting the state’s social services. 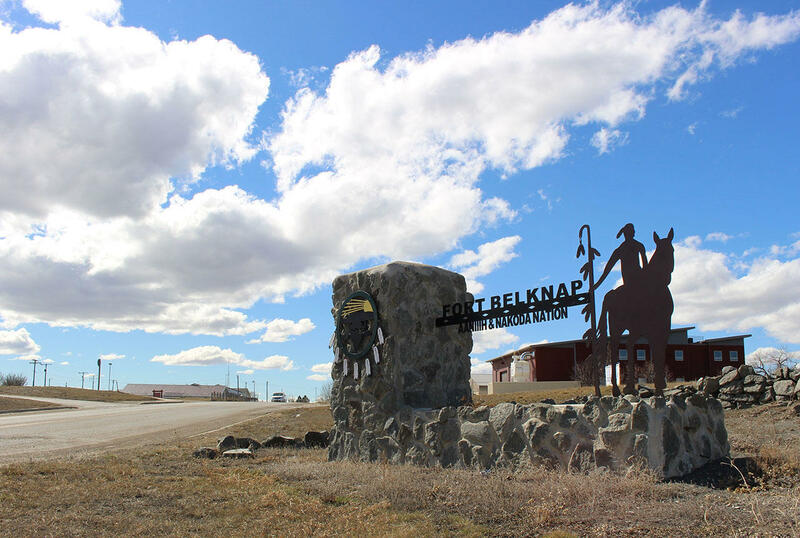 In January the Fort Belknap tribal council declared a “state of emergency” over methamphetamine abuse on the reservation. There’s no hard evidence that meth use at Fort Belknap is any more prevalent than other places in Montana. Authorities statewide say they’re seeing a resurgence in meth use and arrests in recent years, after a decline about a decade ago.